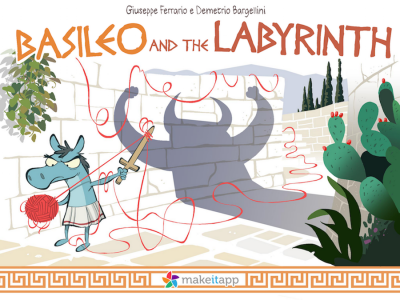 Basileo – an original storybook, a game, a drawing book, a fun way to learn… all in just one app! Do you know who beat the Minotaur in Ancient Greece? Theseus I hear you say? – Well, I would like to introduce you to someone who will tell you a slightly different story: Basileo. Basileo is a Centaur and a very special one of that: differently to all other Centaurs of his time, Basileo has the head of a horse and the lower body a man. And in addition to that he has a dream: he wants to become the greatest hero of Ancient Greece and his first project is to defeat the Minotaur, a deafly creature with the body of a human and the head of a bull. Her son is about to go on a great adventure, which includes being thrown off a ship and being helped by Poseidon, the God of the Sea, on his journey to Crete. Basileo also meets Theseus, who wants to defeat the Minotaur as well. And clearly the story of what happened in the Labyrinth has been told wrong all those years, because when Theseus leaves the Labyrinth saying that he defeated the Minotaur he has left out a few details about Basileo’s involvement in his success. You want to know what exactly happened? Get your Basileo App today and find out! The App “Basileo” is an interactive storybook, which includes many fun games for children and beautifully hand-drawn illustrations on each page. Furthermore, the app includes an original soundtrack and a narrator in three languages. The story is told in a fun and humorous way, which makes reading it as enjoyable for adults, as it is for kids. Furthermore, after the newest update the App now has a dedicated drawing section, where kids can use templates of the main characters of the story to draw their own version of the story and play with the main characters. Basileo and the Labyrinth is the first in a series of many Basileo Sagas and has had a lot of success already. For example, it has been featured on the Homepage of the UK and Italian iTunes Store under “Best Apps for Kids” and has been reviewed by famous journalists in those countries as well.